As promised in my last post on the Hoard, here is a second, very thick trading card of Herschel Walker. 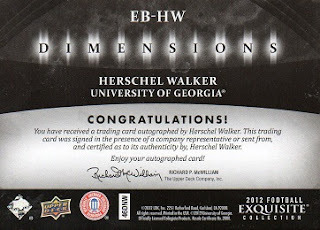 This example is a 2012 Exquisite Dimension Autographs #EBHW. 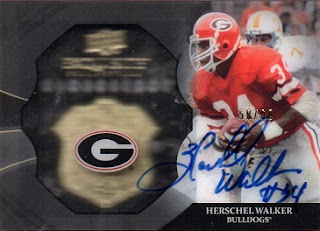 Like the 2011 Exquisite card previously showed, this card is about 5/8ths of an inch thick It's so thick that, as can be seen on the front of the card, the "Upper Deck, Exquisite, Dimensions" text, just above the UGA logo, looks blurred on the scan because of the thickness. However, this has a much cleaner signature than the 2011 card.